I've never been one to cry in public. I always felt embarrassed, as if showing signs of weakness. For me, the mere act of crying is not unlike vomiting. I cannot make myself do it. It just happens. And when that faucet turns on, I never know for how long it might be running. That, mixed with breaking down in front of others, would send me into protective retreat mode. When I was younger, I would go off and cry in the privacy of my bedroom, hiding my self-expressive tears in the sound absorbency of my pillow. That way, no one would hear a thing. 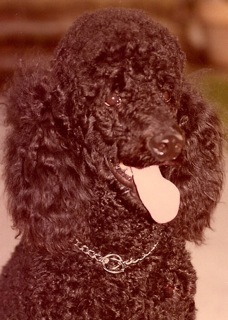 Yet somehow, my black standard poodle Mulligan always knew. He inevitably would come find me, letting me know that he was there. Perhaps he just needed more sodium in his diet, but this fluffy spirit would gently lick the tears from my face. It was soothing to be understood and supported with no exchange of words. No pity, no hampering, no judgment. My dog offered his silent presence and witnessed my vulnerability. This was my first taste of empathy. Empathy is a gift. However, it is not something we learn to cultivate in our culture. Being empathic does not involve advice giving, comparing, fixing, one-upping, sympathizing, discounting, or analyzing. It's a process of holding an empty space in which to foster connection and trust. It's a practice of being present with another. Imagine being attached to a large rubber band as you cross a bridge to visit another person's world. This tether keeps you anchored in your own emotional realm while having the flexibility to venture afar. On this exploration, you also bring your passport to help to maintain your own identity, which can often go astray. The challenge is to not absorb yourself in the other person's story, nor to insert your ego by taking charge. It is a tool to help you and others find empowered clarity outside the field of right and wrong. Empathy is simple, and yet it's anything but easy. So why is it challenging to do? In a society full of blame, shame, and moralistic judgment, it takes practice to carve out an exchange of empathy. You can master asana as well as the other limbs of yoga. But if your inner terrain and outer environs are not in alignment, then the physical practice is just another form of exercise. When you need compassion, then you are in no position to offer it. It's the oxygen mask analogy of first giving yourself support so that you can be supportive of others. If you feel heard and seen, then you can genuinely be present with what's going on, rather than "shoulding" things to be a different way. For me, “Operation Self-Care” has been in full swing this year. Over the past decade, inadvertently I lost a part of myself. In the name of generous service, I had been focusing on others' needs at the expense of my own. I wore myself down. If this at all sounds familiar, I encourage you to pause and ask yourself: What can I do to take care of myself in order to set the stage for more empathic dialogue in my life? How might I foster more compassion in my conversations? How do I fit into my own narrative? I'm happy to say that I am healthier on the empathy diet. 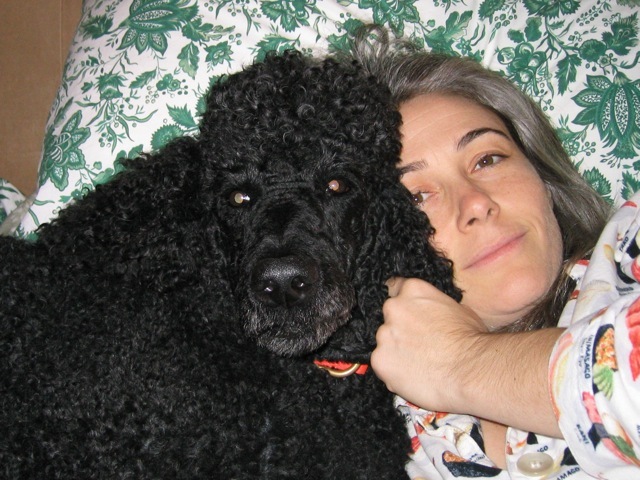 I have re-tasted what Mulligan fed me long ago and of what my subsequent dogs continue to remind me along the way. Acknowledging my emotions, I savor every chance to connect inside and outside. Whether I am crying or observing another's tears, I now consider any display of vulnerability as an indication of resilient strength. This intrinsic and extrinsic dialogue has created cellular shifts, which is the true benefit of yoga. You can do all the physical poses on your mat, but how you posture yourself in life determines your perspective. You choose, one lick at a time. 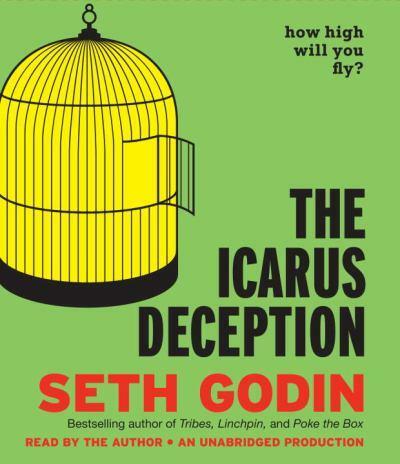 The Greek myth of Icarus is about taking flight and striking a balance between compliance, complacency, and hubris. As one version of the story goes, Icarus' father and master craftsman Daedalus designs a labyrinth for King Minos to imprison the Minotaur monster. After infuriating the king in helping cohorts escape this prison, Daedalus finds himself held captive within his own creation, along with his son Icarus. Fleeing by foot or by sea are not options from the island of Crete. Daedalus therefore decides to escape by air, making two pairs of wings out of feathers and wax for the two of them. 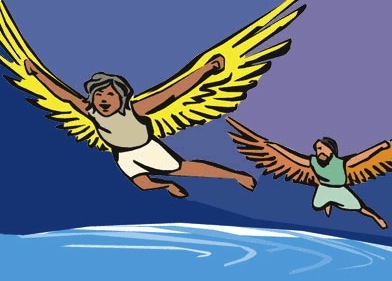 Before leaving the island, the father warns Icarus not to fly too close to the hot sun or too close to the humid seawater, for both extremes will destroy his wings. The young boy is elated by the newfound freedom and soars into the sky towards the bright sun. The heat melts the wax of his wings, and as expected, he falls to his death into the sea. The typical moral of the story is to be wary of the demise that comes from being too self-assured. However, often lost is the other message: if you aim too low in life then you might not reach your highest heights. How high will you fly? This is the over-arching theme of Seth Godin's book "The Icarus Deception." He argues that the main difference between creating a commodity versus art is the presence of risk. Art is a risky business. If you do not allow vulnerability, then perhaps you are playing it safe. But that doesn't mean to fly recklessly high. The goal is to express your greatest potential while not getting in your own way. Are you a creator or a consumer of life, or perhaps a mix of both? I think it depends on how much your heart is involved. Being vulnerable can be scary. It's an extrinsic expression of an intrinsic strength. Contentment is about leading a fulfilling life that still has room in which to explore both the known and the unknown. British actor Patrick McGoohan traded in his James Bond-type popularity by taking a huge leap in creating The Prisoner, a TV show so ahead of its time that only a select audience "got" at the time. Musician David Byrne walked away from his Talking Heads rock star status in order to live up to his dreams, rather than up to his fans' expectations. Both "successful" artists wanted to continue to push their passionate edges and carve out unmarked paths. This takes courage. To me, delving into uncertainty seems less scary than living a predictable life. Yoga is a practice of integrating your curious mind, empathic heart, and intelligent body. It invites you to live a skillful, artful, and meaningful life. If you don't establish a strong self-connection, then you might be pleasing everyone but yourself. And if you do not feel connected to those around you, then you have lost the common thread that ties our humanness together. 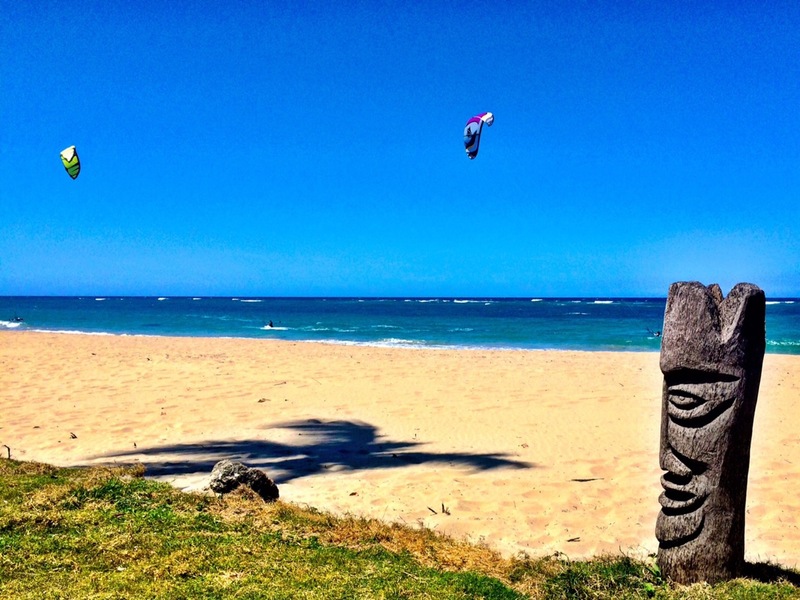 As Seth Godin suggests, "Fly closer to the sun. Become naked and vulnerable in front of those you give your art to, and seek connection." Like Daedalus and Icarus before you, create your own myth. Take risks. Take flight. See where your wings bring you, in the glorious pursuit of life. The balance of all things is in their opposites. thus the clenched fist holds weakness within. And the open hand offers the hidden power of suns. Have you ever felt cornered by a decision? Do you feel often stuck in a cycle of behavior that no longer works? Do you wish to find a release from entanglement that originally felt comforting and even desirable? Perhaps it's time to practice the art of letting go. This trap is a great metaphor of how to appreciate something without having to possess it. Or to value someone without clinging. 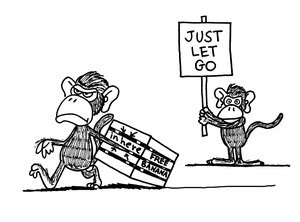 The way to escape the monkey trap is to simply let go. Easier said than done. This by no means is a passive endeavor. It takes action to relinquish expectations that you hold on to so tightly. In fact, it can feel quite scary. But has the discomfort of clutching to the familiar become more of a hindrance than the fear of release? Yoga is a practice of questioning your deeply engrained patterns on physical, mental, and emotional levels. Just because something is habitual doesn't mean that it's beneficial. "Aparigraha" is the Sanskrit term for non-grasping. If some behavioral defaults no longer serve you, then it's time to loosen your grip of assumptions, situations, and perhaps relationships. Before you can blossom into springtime, you must first have ample space in which to germinate and grow. As you move from winter into the next season, there is an opportunity to clear out. Spring cleaning is a way to free up stuck energy and to recognize that which you treasure without feeling bound by it. 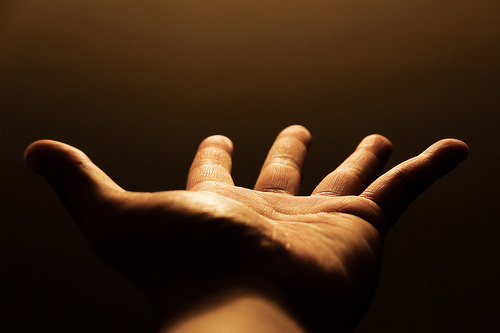 An open palm is more receptive than a clenched fist. 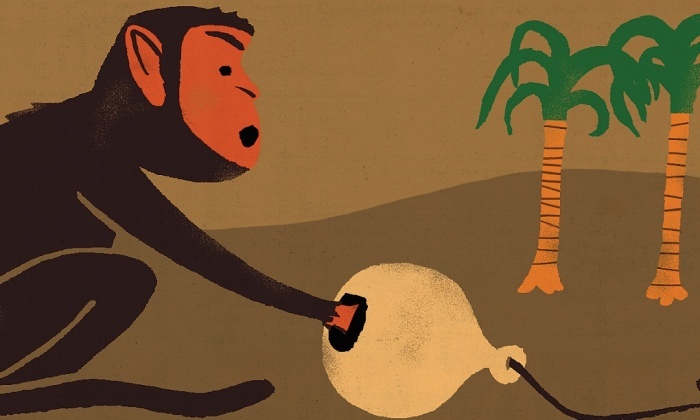 Your monkey mind can chose to either hold on to the tangible treat inside the trap or to loosen the grip in hopes to find other nourishment. You gotta know when to hold ‘em, and know when to fold ‘em, with various options in between. A full spectrum is within your reach. Your choices might help the fabric of your life to have less static and be more cling-free.